Giant anteaters are the largest of the four anteater species; giant anteater, silky anteater, northern tamandua, southern or lesser tamandua. 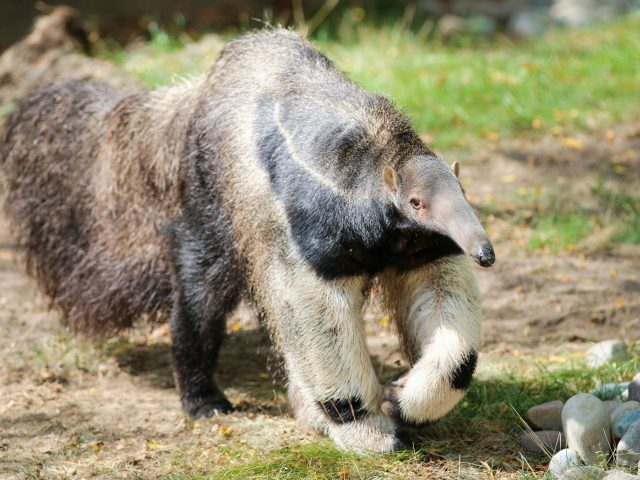 Anteaters have no teeth, instead they have a 2 foot long specialized tongue which allows the anteater to easily eat up to 30,000 ants and termite every day. The Giant Anteater’s sense of smell is 40 times more powerful than humans! 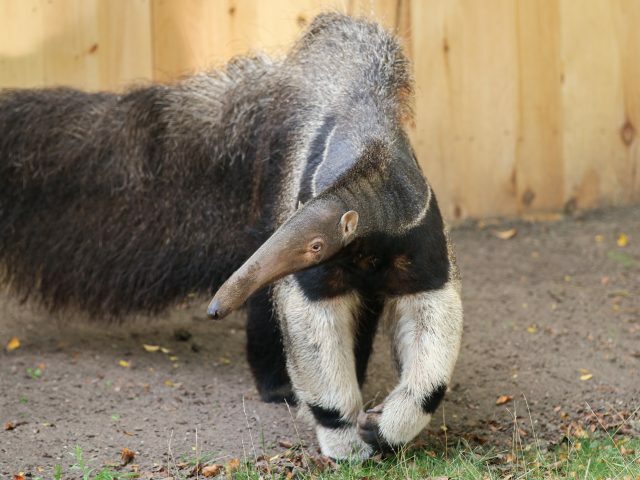 Giant Anteaters are solitary, except for mothers and their offspring.Offspring are carried on their mother’s back, aligned with the white stripe, so that they are very well camouflaged. 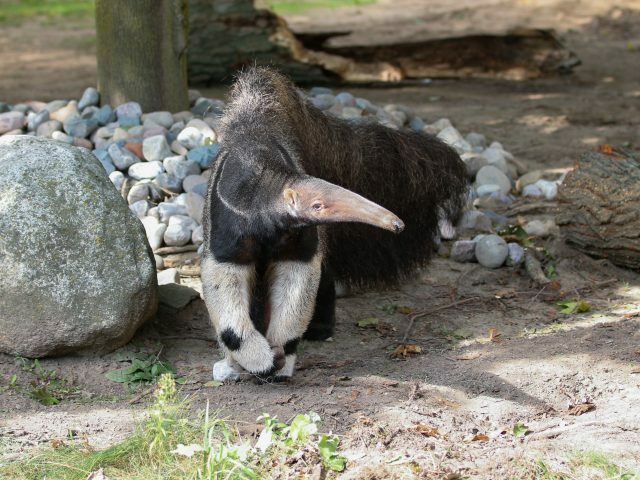 Anteaters walk on their “fists” so they can keep their claws sharp for digging into termite mounds. Claws are also used in defense – they have been known to fight off large predators like jaguar. It is estimated that only 5,000 giant anteaters remain in the wild. 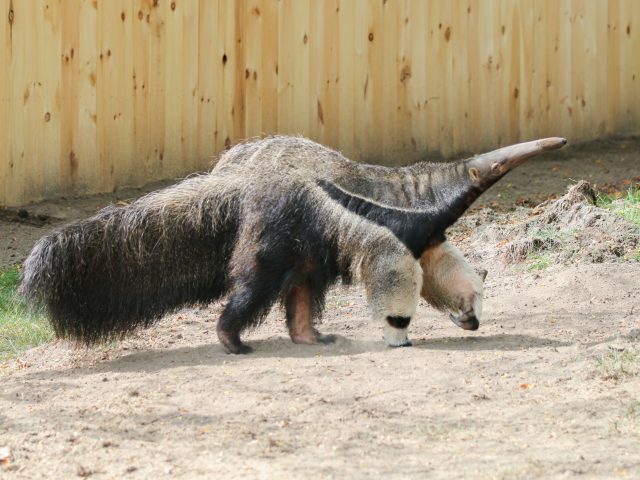 Giant anteaters are considered a threatened species overall though in some areas they previously inhabited they are now extinct; they are hunted for food, hit by cars and driven out of habitat or burned in fires as land is converted for farming. 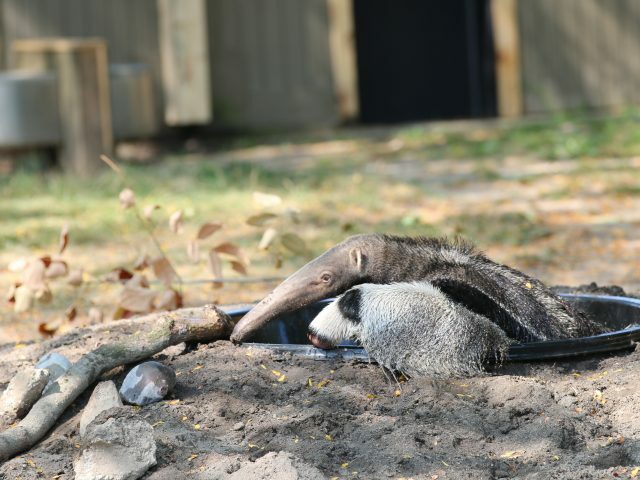 Zoos accredited by the Association of Zoos and Aquariums (AZA), like Potter Park Zoo, are working with giant anteaters to maintain an assurance population and to support conservation programs in their home range. What YOU can do to help: Reduce poaching worldwide by following legal hunting practices in your area. Click here to learn about the legal licenses and open hunting season in Michigan. Males can weigh up to 110 pounds and Females can weigh up to 120 pounds. They can grow to be up to 6 1/2 feet long! Median Life Expectancy: Males 14.1 and females 11.1 years. The majority of the diet is made up of ants and termites, which are detected by smell.